I just discovered Artist Trading Coins. Basically, they are round artist trading cards. This will be my first time to make them so I am going to make this a newbie friendly swap...with some parameters. Artist Trading coins are 2.5 inches in diameter. I looked up ATC's on you tube and found some very helpful videos to make my first ones. you will need cardstock or posterboard for your base. Let's go artsy and do several different techniques on these. Gelli Plate, watercolor, colored pencils, embellishment, stamping...etc. 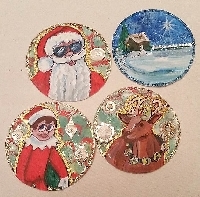 Make these Christmas Themed Artist Trading coins beautiful. If you find that you don't like them, they can at least be turned into Christmas tags by adding a string to them! Put a label on the back that tells your partner your name, the date, and title of your coin. I took my 40% off coupon to Michaels and purchased a 2.5" hole punch to help me make mine. The Swap: 1. You will make three 2.5 inch artist trading coins for one partner. You will make them Christmas themed. You will send them in a Christmas card. If you are a newbie, you will need to have a very well filled out profile so that we can get to know you. If you are an established swap-botter, your rating must be at least a 4.9 to participate. I don't mind angeling, I just don't want to have to. No ones or threes in the last 6 months.